It's another jam-packed day. I'm Jessica Menton, here with your daily dose of markets. Stocks aim to close out February on a high note. The Dow and S&P 500 are headed toward their best-ever start to a year since 1987, with both indexes up 11% in 2019. Futures are slipping after stocks moved lower the past two days. U.S. economic growth is in focus. Investors are awaiting the government's initial reading on fourth-quarter GDP, which was delayed due to the partial government shutdown. Fed chief Jerome Powell said this week that the central bank is in no rush to move interest rates while officials assess the impact on the U.S. economy of slower global growth. More retail earnings are on tap. Traders will parse J.C. Penney's results this morning, followed by Gap and Nordstrom after the bell. Results from retailers have been mixed thus far, with Macy’s signaling Tuesday that 2019 would be a challenging year. Plus, European stocks are also having a strong year. Our Joe Wallace and Akane Otani explain why hedge funds and retail investors are still skeptical. Global stocks slipped for a third straight day Thursday after U.S.-North Korea nuclear talks abruptly ended without a deal and weak economic figures pressured Asian indexes. 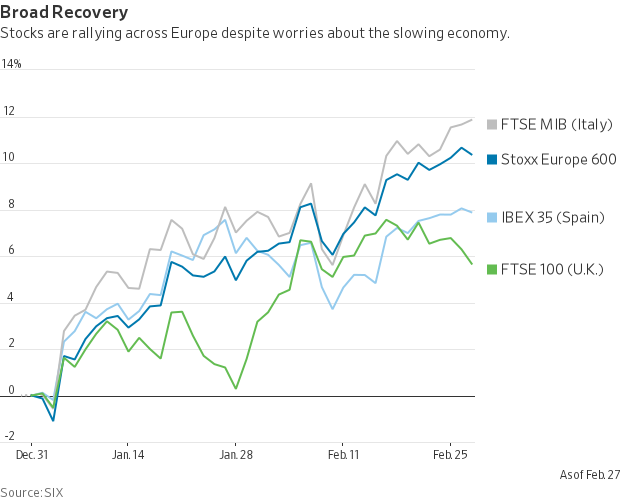 European stocks have enjoyed their best start to a year since 2015, jolting investors who worry that threats including slowing growth and a disruptive Brexit could bring the rally to a skidding halt. The Stoxx Europe 600, which tracks large, mid- and small-cap stocks, had gained 10.3% in 2019 through Wednesday, putting it on course for its best combined January and February in four years. The index is within striking distance of surpassing the S&P 500, which is up 11.4%. Despite the rally, a number of money managers are skeptical the gains can last. The U.K.’s relationship with the EU remains unresolved a month before its scheduled departure. Spain is set for snap elections in April that could see the hard-right Vox party emerge as king maker, and Italy’s governing coalition of anti-establishment parties remains unstable. Investing in European shares from the U.S. has been almost as lucrative as doing so from the other side of the Atlantic. In dollar terms, the Stoxx Europe 600 is still up 10%, because the euro has largely held its own against the greenback. Exchanges have rallied across the continent, with particularly strong showings in Italy, Sweden and Switzerland. One factor working in European stocks’ favor: they look relatively cheap. Even after the recent advance, the Stoxx Europe 600 trades at around 13.5 times forecasts of earnings over the next year, versus 16.4 for the S&P 500. Still, rising share prices haven’t drawn fresh money into retail equity funds. For the past six weeks, and for 45 over the past year, mutual and exchange-traded funds that track European stocks have seen more money flow out than in, according to Lipper. One thing keeping investors cautious: as U.S.-Chinese trade tensions simmer down, Europe’s own relations with the U.S. are coming to a boil. On Feb. 20 President Trump described the European Union as “very difficult over a period of time, over many, many years” and said he could impose tariffs on autos from the bloc. Each sector in the S&P 500 is on pace to notch gains for the second consecutive month for the first time since 2013, led by industrials (19%), energy (14%) and technology (14%). Copper prices have rallied 13% to $2.9590 a pound over the past two months, driven by diminished supply and optimism over U.S.-China trade negotiations. That puts the metal on course for its biggest two-month percentage gain since August 2017. On this day in 1827, America’s first great growth industry was born. Two dozen business leaders incorporated the Baltimore and Ohio Railway to link Baltimore with Wheeling, W.Va., connecting the western frontier with the eastern seaboard. U.S. jobless claims, released at 8:30 a.m. ET, are expected to rise to 220,000 from 216,000 a week earlier. U.S. gross domestic product for the fourth quarter, also issued at 8:30 a.m., is expected to rise at a 2.2% annual rate. The Chicago purchasing managers index for February, posted at 9:45 a.m., is expected to inch down to 56.1 from 56.7 a month earlier. Natural-gas inventories are scheduled for 10:30 a.m. Stockpiles are expected to have fallen 173 billion cubic feet last week, a larger-than-normal drop for this time of year, according to the average target of 13 analysts and traders surveyed by the Journal. The Kansas City Fed manufacturing survey for February, due at 11 a.m., is expected to hold steady at 5. Fed speakers: Fed Vice Chairman Richard Clarida speaks on monetary policy at 8 a.m., the Atlanta Fed’s Raphael Bostic speaks on housing at 8:40 a.m., the Philadelphia Fed’s Patrick Harker speaks on the economic outlook at 12:15 p.m., the Dallas Fed's Robert Kaplan speaks in San Antonio at 1 p.m., the Cleveland Fed's Loretta Mester speaks at a women in economics symposium at 7 p.m., and Fed Chairman Jerome Powell speaks on recent economic developments at 8:15 p.m.
Fidelity is under investigation over obscure mutual-fund fees. 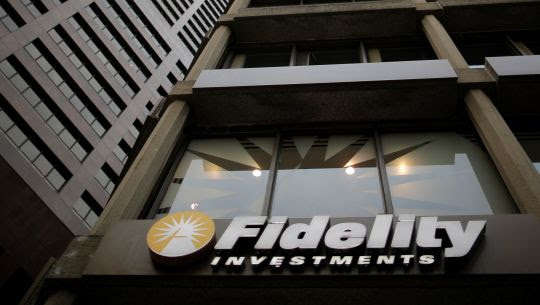 The Labor Department is investigating Fidelity Investments over an obscure and confidential fee it imposes on some mutual funds, according to a person familiar with the inquiry. China’s building boom has hit a great wall of debt. “There’s no money right now.” A building splurge in an impoverished pocket of rural China ended in half-finished projects and a trail of angry investors from some of the country’s wealthiest areas. The Fed chief said officials are close to finalizing a portfolio-runoff plan. Federal Reserve Chairman Jerome Powell said the central bank is close to announcing plans for ending the runoff of its $4 trillion portfolio of bonds and other assets this year. In a hard-fought battle, the CFTC conceded defeat against a big trader. The regulator won’t appeal a federal court ruling dismissing a market-manipulation case against Donald Wilson Jr. and his firm DRW Investments. A big Bristol-Myers shareholder opposes the Celgene deal. Wellington Management, which has about an 8% stake, said the $74 billion deal asks shareholders to take on too much risk. Venezuela is cushioning the blow of oil sanctions with non-U.S. sales. Venezuela, under U.S. embargo, has shifted some of its crude exports from American refiners to India and Europe, according to the country’s oil minister and ship-tracking firms. Some Uber and Lyft drivers will get stock in their IPOs. Ride-hailing companies Uber Technologies and Lyft are planning to give some drivers the chance to take part in their initial public offerings, a rare move that would grant them access to two of the most hotly anticipated IPOs ever. Square: The payment-processing company's first-quarter earnings outlook missed analysts' estimates. L Brands: The parent company of Victoria's Secret posted revenue in the holiday quarter that came in just shy of Wall Street forecasts while its full-year profit guidance missed expectations. HP: The company's sales missed analysts' targets in the latest quarter but it maintained its full-year outlook on adjusted profit. Box: The cloud-storage company's profit and revenue outlook for the first quarter fell short of analysts' estimates. Fitbit: The maker of wearable fitness devices turned in a weaker-than-expected outlook for the first quarter. Monster Beverage: The company's profit rose in the fourth quarter, boosted by a rise in sales of its signature energy drink brand.